A child with autism who has trouble connecting with his peers and the world at large, may find himself learning from and making a meaningful connection with… a cow? The image is awe-inspiring, poignant, and becoming more and more common as domesticated animals take their place in therapeutic forums, as reported in Modern Farmer. We’re strong believers in the idea that the animal-human bond, if cultivated carefully and respectfully, can reap amazing benefits to both sides. Author, engineer, and activist Temple Grandin’s life is a prime example of how this bond can help people with autism function better in the often-changing and socially complex world. So it’s heartening to know that there are now more than 3,000 Animal Assisted Interaction Programs across the country, designed to help humans heal and create a natural relationship with animals while simultaneously strengthening their own social and emotional skills. From the more formally recognized Animal Assisted Therapies model (in which a professional in fields of medicine, social work, or perhaps occupational or speech therapy leads a therapy session involving animals) to less formal programs like Animal Assisted Activities, to simple anecdotal evidence from families with children on the autism spectrum who happen to live on a farm, the power of people and animals working together is undeniable and effective. While professionals caution that bonding with animals is simply one part of an often complex therapy, the science behind these interactions is sound as well: simply being around animals causes an increase in mood-boosting and stress-reducing neurochemicals such as dopamine and oxytocin in the brain. 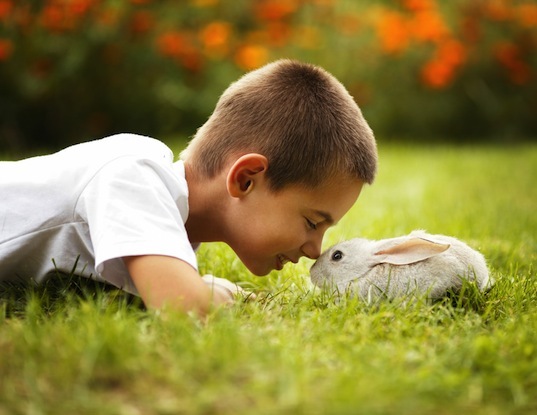 The release of neurochemicals during these positive interactions have been associated with numerous positive side effects for everyone, but they are especially helpful for children with autism as they learn to connect, attach, and trust both the animals and themselves. While chickens appear to be a popular therapy animal, other possibilities include dogs, cats, goats, sheep, rabbits, other fowl, cows, lamas, alpacas, and pigs. For more reading about the animal-human bond, please read Temple Grandin’s Animals Make Us Human and Animals in Translation: Using the Mysteries of Autism to Decode Animal Behavior. A child with autism who has trouble connecting with her peers and the world at large, making connections and learning from…a cow? The image is awe-inspiring, poignant, and becoming more and more common as domesticated animals take their place in therapeutic forums, as reported in Modern Farmer. We’re strong believers in the idea that the animal-human bond, if cultivated carefully and respectfully, can reap amazing benefits to both sides. Author, engineer, and activist Temple Grandin's life is a prime example how this bond can help people with autism function better in the often-changing and socially complex world. So it’s heartening to know that there are now more than 3,000 Animal Assisted Interaction Programs across the country, designed to help humans heal and create a natural relationship with animals while simultaneously strengthening their own social and emotional skills. From the more formally recognized Animal Assisted Therapies model (in which a professional in fields of medicine, social work, or perhaps occupational or speech therapy leads a therapy session involving animals) to less formal programs like Animal Assisted Activities to simple anecdotal evidence from families with children with autism who happen to live on a farm, the power of people and animals working together is undeniable and effective. While professionals caution that bonding with animals is simply one part of am often complex therapy, the science behind these interactions is sound as well: simply being around animals causes an increase in mood-boosting and stress-reducing neurochemicals such as dopamine and oxytocin in the brain. The release of neurochemicals during these positive interactions have been associated with numerous positive side effects for everyone, but they are especially helpful for children with autism as they learn to connect, attach, and trust both the animals and themselves. 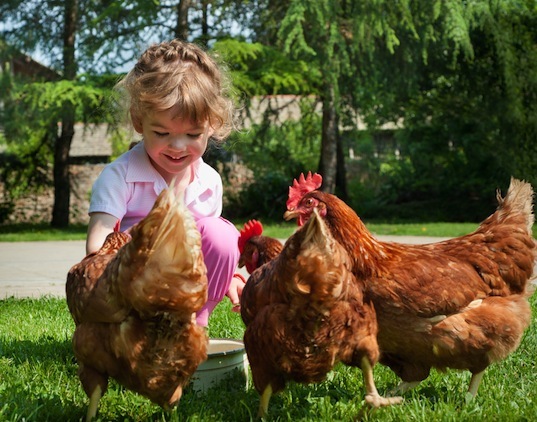 While chickens appear to be a popular therapy animal, other possibilities include dogs, cats, goats, sheep, rabbits, other fowl, cows, lamas, alpacas, and pigs. For more reading about the animal-human bond, please read Temple Grandin's Animals Make Us Human and Animals in Translation: Using the Mysteries of Autism to Decode Animal Behavior .